2 bedroom apartment that sleeps 6 persons. Personal wifi. The apartment, with wonderful views of the Marina and only a short walk from the historical centre of Lagos can provide its guests with very spacious accommodation. The apartment has a well equipped kitchen, spacious lounge with sofa bed and dining area which leads onto a good sized balcony. The balcony has a table and chairs for 'al fresco' dining plus 2 sun chairs. The apartment has a double bedroom and a second bedroom accommodating 3 single beds plus two complete bathrooms. The apartment is equipped with its own personal wifi dongle. For an additional cost of €160.00 for 4 passes for a weeks stay - guests can make use of the exterior swimming pool at the Marina Club Hotel. Free parking is available in the underground garage with elevator access to apartment floor. Various cafes, restaurants and a large supermarket are situated approximately 200 metres from the apartment. Rustig gelegen appartement waar alles in zit wat je nodig hebt. Een aanrader. Ideal location for Lagos town, beaches and bars. Great view of marina. We didn't want a car, so Julie arranged an airport transfer. Walked to the excellent beach and bars. Used local train to visit towns....short walk into wonderful Lagos and local marina bars. Great family holiday in a superb apartment. De woning voldeed goed, maar kan beter. De keuken apparatuur is gedateerd en werkt niet volledig, bijvoorbeeld klep van de vaatwasser stort naar beneden en de koelkast / vriezer werken niet goed. Het twee persoonsbed is klein en het matras hard en van goedkope kwaliteit. Prima vonden wij dat voor de auto een plaats is in de parkeergarage, er voldoende ruimte is en spullen om te gebruiken. tijdens ons verblijf van een week waaide het behoorlijk en was er geluidsoverlast vanuit de haven waar de masten behoorlijk herrie maakten, fluiten en zoemen was onaangenaam op het balkon. binnen heb je er geen last van. Supermarkt is aanloopbaar, lekker verse broodjes halen om 08.00 uur. Al met al wel een fijn verblijf gehad. Goede uitvals basis om de stranden ni de omtrek te ontdekken met de auto. Zeewater is echter aan deze kant wel fris. Located on the award winning Marina de Lagos, central to town centre, facilities, this spacious two bedroom apartment offers the perfect setting for a relaxing holiday. Due to its location there are plenty of opportunities to enjoy water sports including sailing, windsurfing, diving. There are also some excellent golf courses in the area, the nearest being Palmares, then Quinta da Boavista, a 5 minute drive out of Lagos. Further along the west coast in the direction of Sagres there is another excellent golf course called Parque da Floresta. 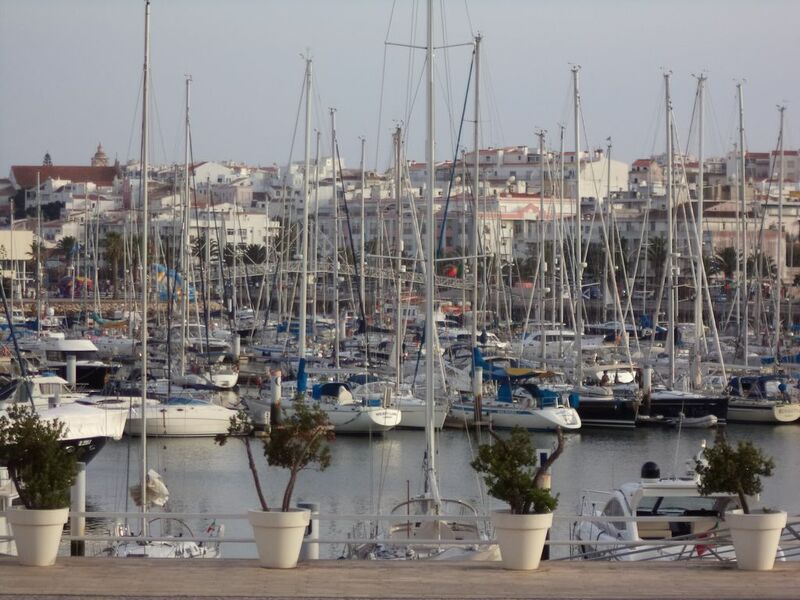 There are plenty of interesting towns to visit such as Portimão, Silves & Loulé. For those who just like to sunbathe, there are plenty of beaches to choose from, all of which have beautiful soft golden sand and wonderful rock formations. A trip around the grottos is well worth a visit. There are a wide choice of restaurants to choose from in Lagos which serve both local and international cuisine. There is a very good supermarket within walking distance of apartment. For unlimited access to the exclusive 4 star Marina Club swimming pool, only a 2 minute walk from the apartment, an extra charge will be made of €160.00 per week for 4 persons. Easter, Christmas & New Year rates same as September. Taxi Transfers can be arranged. Late night arrival charge (after 10pm at property) - €30 Travel Cot, High Chair, Camp Bed hire - €30 per week Welcome packs available - Small €25 Large €50 Please contact the Manager for their cancellation policy.